Pakistan v New Zealand 3rd Test at Sharjah turned out to be a jackpot match for me. What I call a jackpot match is the one which follows my prediction. I manage to make £6,585.00 in profit at Betfair. A Cricket match can be very unpredictable but if you know the inside out then it’s not too difficult to predict. Pakistan’s odds were too low before match started so I didn’t start trade and decided to wait. At the end of day 1 Pakistan were 281/3 and I predicted them to touch 400 runs mark. Anticipating this score I put my first bet. Today morning when I woke up I found that I’ve hit the jackpot. Pakistani tailenders gave up and NZ were dominating the match. 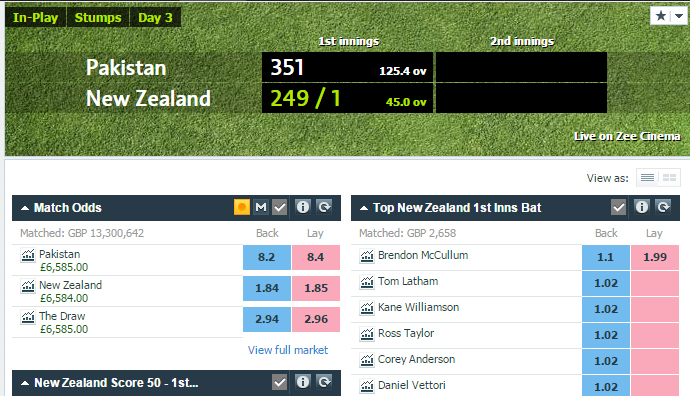 NZ score was 90/1 and I decided to apply Tarazu and managed to green up with £6,585.00. As it stands out I’ll make £6,585.00 of profit irrespective of the match result. Overall effort involved was just two click, less than 5 minutes of time and about £1k of stake which resulted in £6,585.00 of profit. so what are you waiting for? Open account at Betfair. If you require any help then contact me, it’s all free help provided you follow my instructions. A humble request if you can also tell when you thought of backing Pak or NZ or Draw with what odds at least for this match which will be more helpful for guys like us who are lagging behind in tarazu skills.You have written anticipating PAK to reach 400 score you placed your first bet(at what odds was that ?) and then again which odds were there when u greened up.